Remand is a great example of a card that “deserves a second chance”. At first, it may look like a “bad counterspell”, to be used only if there weren’t enough two mana cost counterspells in the format. Actually, comparing Remand to Counterspell isn’t that appropriate. Counterspell is a hard counter, quite underpriced, whose effect is to counter a key spell of your opponent. The best control card. Counterspell has to be played with care, at the right moment; it shouldn’t be wasted to counter the first spell that your opponent uses. 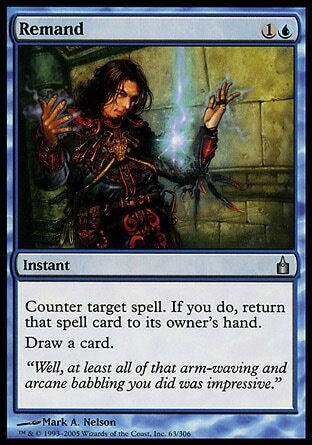 On the other hand, Remand doesn’t counter the spell (the card is returned to the hand) – it just “counters” it for a while. If your opponent tapped out to cast a spell, Remand has the effect of making his entire turn useless, and we also draw a card. Remand isn’t a control card, it’s a tempo-oriented card. In this case, we are happy to play it as soon as possible, in response to any of our opponent’s spells; our goal isn’t to counter that specific spell, but to make our opponent’s turn useless and gain enough time to develop our strategy. are we starting our combo? Our opponent has no “next turn”. Living End has been cast with cascade? We make our opponent return Living End to his hand, making his next to useless. Of course, Remand has limitations. For example, it’s a spell that has a target, which means that it cannot be cast if there are no legal targets, which are only spells on the stack. Then, a spell can’t target itself, therefore Remand can’t be cast on itself. We can cast Remand on our own spells, if we want. Casting Remand on a spell that cannot be countered (like Supreme Verdict) is a legal action. Supreme Verdict can’t be countered and will end up in the graveyard; Remand will still resolve, will end up in the graveyard and will allow us to draw a card. Remand can be cast targeting a spell that isn’t a card. Let’s imagine our opponent has an Isochron Scepter with an imprinted card. He uses the ability of the Scepter to copy the imprinted card and to cast the copy. Remand can be cast targeting the copy. The copy gets countered and is returned to our opponent’s hand. We draw a card for Remand. Remand finishes resolving. Before anyone receives priority, state based actions are checked and the copy of the spell in our opponent’s hand ceases to exist. Remand can be cast to target a spell with flashback, and this is actually a good choice, as the spell will be countered and exiled. Remand has a self-replacement effect, which sends the countered spell directly to the hand instead of to the graveyard. Flashback creates a replacement effect. When a spell cast with flashback leaves the stack, it is put into the exile zone instead of any other zone. Self-replacement effects are always applied before replacement effects. • then we apply the replacement effect of flashback. Call of the Herd goes to the exile zone instead of to the hand. Let’s make sure that there is no confusion between flashback and unearth. Unearth is an ability that returns to the battlefield, temporarily, a creature card from the graveyard; the creature card is never a spell and is never on the stack. If Hellspark Elemental is being returned to the battlefield thanks to unearth, we can’t respond with a counterspell.